Before I had baby Jake, I didn't really know much about baby clothes... or what I wanted from them. 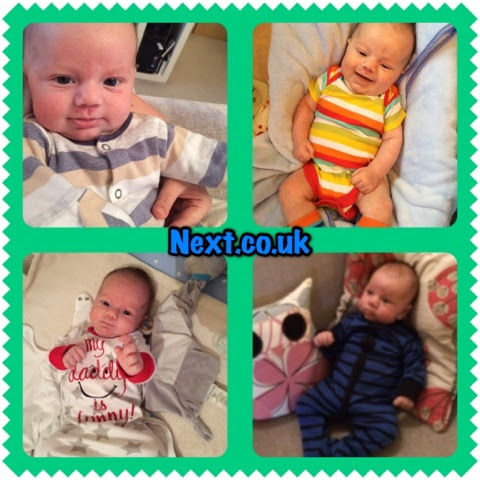 Whilst I was pregnant, I bought a lot of 'up to one month' and '0-3 month' items from Next Directory via Next Online. The majority of baby Jake's clothes at the moment are from Next - either items I have bought myself, been given as gifts or are some of the items we were given second hand from family friends. As you can see, baby Jake loves his Next vests and baby grows - and so do we! Now that baby Jake is getting bigger (easily fitting in to size 0-3 months already) we're venturing out to jeans, T-shirts and jumpers in the 3-6 month size... but prices do seem to go up a little here. We'll have to shop smart and get the bargains where we can. Does your little one like Next clothes? Where's your 'go to shop' for your little one's outfits?